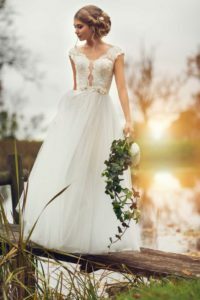 A wedding gown in the life of any girl is a sweetness of choice, a delight of keeping a beautiful dress in possession, admiration in the eyes of a loved one, and the most memorable thing for many years. A-line wedding dress is a real gift for every bride. That is because now there is no need to torture yourself with a tightly laced corset to create an effect of the hourglass. Proper emphasis on the waist and skirt extended to the floor are suitable for any figure. There is something special about an A-line dress that’s hard to describe but that prompts even first ladies and celebrities to choose this type of dress. In such a dress, especially wedding one, every woman looks like a queen. For the first time, the term “A-line” was coined by Christian Dior, who created A-line dresses for his spring collection in far 1955. This designer was a real magician who brought feminine back to the women’s fashion. Therefore, it’s not surprising that it was Christian Dior who gave the world A-line dress. A-line bridal gown, as the name suggests, is reminiscent of the letter “A”. It is a classic model of a wedding dress that has a close-fitting bodice perfectly accentuating a bride’s waist and breast and a beautiful skirt extending smoothly to the floor. The classic lines of this dress flatter any body type because they can hide all the figure flaws. Indeed, A-line bridal gown creates a fairy princess silhouette. Moreover, it is needless to say that every girl dreams to be a princess. A simple A-line wedding dress needs a 1-3 hoop petticoat. A huge selection of fabrics and colors and a variety of decorations, such as stones, beads, pearls, and embroidery, will help make your bridal look fabulous and unique. A-line dresses are the most popular ones among all the wedding dresses. Also, it is thanks, numerous benefits of these dresses which attract millions of brides around the world. So, let’s look at the advantages of an A-line wedding dress. A dress works wonders with a bride’s figure showing it in the most favorable light. A dress allows a bride to improve posture making it excellent because the tight waist part perfectly supports the back. A dress adds a romantic touch, elegance, tenderness, and beauty to the bridal look. One-piece dress cutting gives the bride an opportunity to highlight what she wants to highlight in her wedding dress. Plunging neckline beneficially emphasizes the bride’s breast, while long train adds nobility to a wedding look. Due to the natural waistline and absence of tight corset. Such a dress model is also suitable for pregnant brides who prefer a dress with a full skirt. We offer brides the latest bridal collections in which each bride can find the desired A-line lace wedding dress. All dress models are charming and beautiful in their way and ideally suited for both modest and luxurious wedding celebrations. Moreover, highly professional consultants from our bridal shop will help you choose your unique wedding style. Whichever style you choose, remember that in our A-line bridal gown you will be a queen for your fiance and all guests on your wedding day!